For fans of Game of Thrones, April cannot come soon enough. 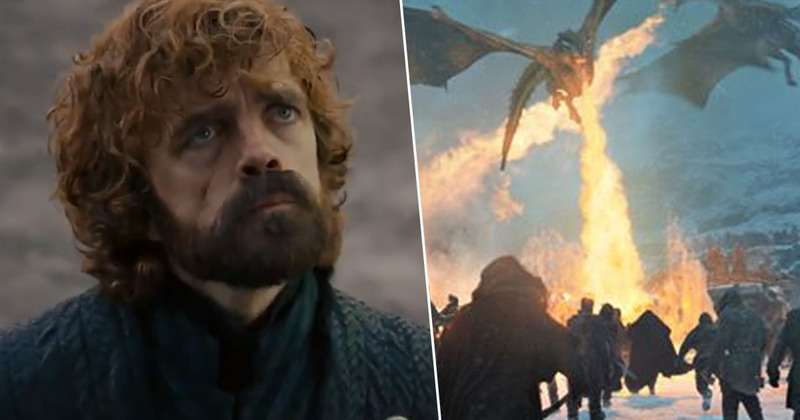 And now, to make the wait even worse, HBO have – for the final time – dropped one hell of a trailer for the eighth season. More than a teaser, less than an episode (sadly), this is the best look we’ve had so far at the action we can expect from the final season of the epic saga. So what does it tell us? Well, as with all trailers, so much but so little. It seems Arya Stark ‘knows death’, there’s lots of running through dark corridors, and everyone and their armies – and dragons – are advancing swiftly towards Winterfell. We hear Jon Snow saying: ‘Our enemy doesn’t tire, doesn’t stop, doesn’t feel’. It seems the showdown between the living and the dead is finally upon us. Winter is finally here. Elsewhere, Jaime Lannister promises to ‘fight for the living’, while his sister Cersei – briefly, finally – looks rather worried about what’s going down. We see Jon and Daenerys Targaryen (have they worked out if they’re related yet?) chilling with her dragons, which all seems very cool until – of course – we see the spindly, evil feet of the Night King’s horse approaching. It’s all very brooding, very dark, and very exciting. Not least because one of the show’s directors, Miguel Sapochnik, recently revealed he studied The Battle of Helm’s Deep, from The Lord of the Rings: The Two Towers, for inspiration behind the final showdown in GoT. If you’re unfamiliar, the Helm’s Deep battle is basically one of the most epic sequences – in size and scope – ever committed to film. Hoping to out-do this, however, the GoT team reportedly spent a gruelling 55 days shooting their battle sequence, mostly at night, which Iain Glen, who plays Ser Jorah Mormont, called ‘the most unpleasant experience‘. This can only be good news for fans of the show though. Sorry Iain, but I can’t wait to revel in the gruelling conditions the GoT cast went through, it’s going to be great television.